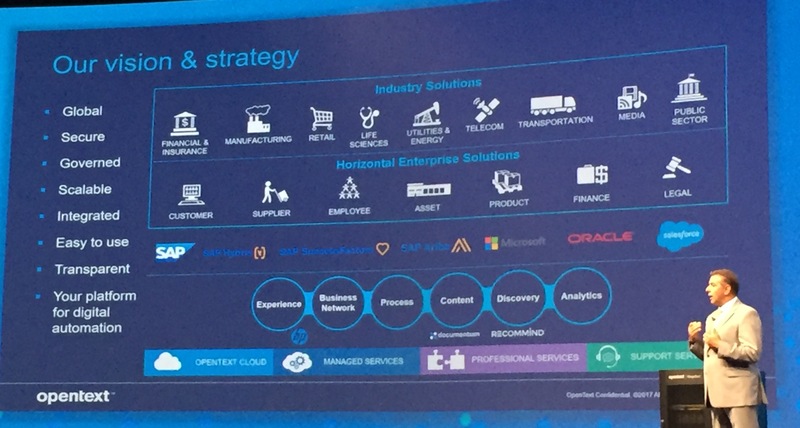 We had a brief analyst Q&A yesterday at OpenText Enterprise World 2017 with Mark Barrenechea (CEO/CTO), Muhi Majzoub (EVP of engineering) and Adam Howatson (CMO), and today we heard more from Majzoub in the morning keynote. He started with a review of the past year of product development — specific product enhancements and releases, more applications, and Magellan analytics suite — then moved on to the ongoing vision and strategy. Dean Haacker, CTO of The PrivateBank, joined Majzoub to talk about their use of OpenText content products. They moved from an old version of Content Server to the curret CS16, adding WEM integrated with CS for their intranet, Teleform for scanning, and ShinyDrive (OpenText’s partner of the year) for easy access to the content repository. The improved performance, capabilities and user experience are driving adoption within the bank; more of their employees are using the content capabilities for their everyday document needs, and as one measure of the success, their paper consumption has reduced by 20%. Majzoub continued with a discussion of their recent enhancements in their content products, and demoed their life sciences application built on Documentum D2. There’s a new UI for D2 and a D2 mobile app, plus Brava! widgets for building apps. 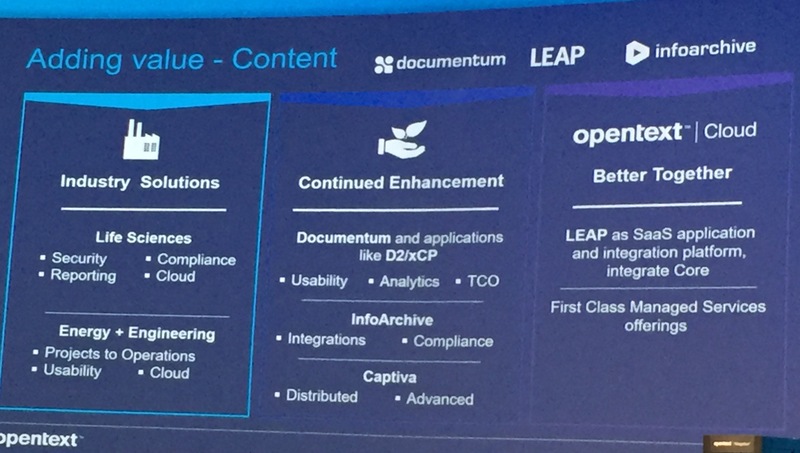 They can deploy their content products (OTMM, Content Suite, D2 and eDocs) across a variety of OpenText Cloud configurations, from on-premise to hybrid to public cloud. Content in the cloud allows for external sharing and collaboration, and we saw a demo of this capability using OpenText Core, which is their personal/team cloud product. Edits to an Office365 document by an external collaborator (or, presumably, edited using a desktop app and saved back to Core) can be synchronized back into Content Suite. A demo of Exstream for updating and publishing a customer communication asset, which can automatically push the communication to specific customers and platforms via email, document notifications in Core, or mobile notifications. It actually popped up in the notifications section of the Enterprise World app on my phone, so worked as expected. Their People Center HR app, which we saw demonstrated yesterday, built on AppWorks and Process Suite. A demo of Extended ECM, which integrates content capabilities directly into other applications such as SAP, supporting both private and shared public cloud platforms for both internal and external participants. Enhancements coming to Business Network, which is their collection of supply chain technologies, including B2B integration, fax, secure messaging and more; most interesting is the upcoming integration with Process Suite to merge internal and external processes. A bit about the Covisint acquisition — not yet closed so not too many details — for IoT and deveice messaging. AppWorks is their low-code development environment that enables both desktop and mobile apps to be created quickly, while still supporting more advanced developers. Applying machine-assisted discovery to information lakes formed by a variety of hetereogenous content sources for predictions and insights. eDOCS InfoCenter for an improved portal-style UI (in case you haven’t been paying attention for the past few years, eDOCS is focused purely on legal applications, although has functionality that overlaps with Content Suite and Documentum). 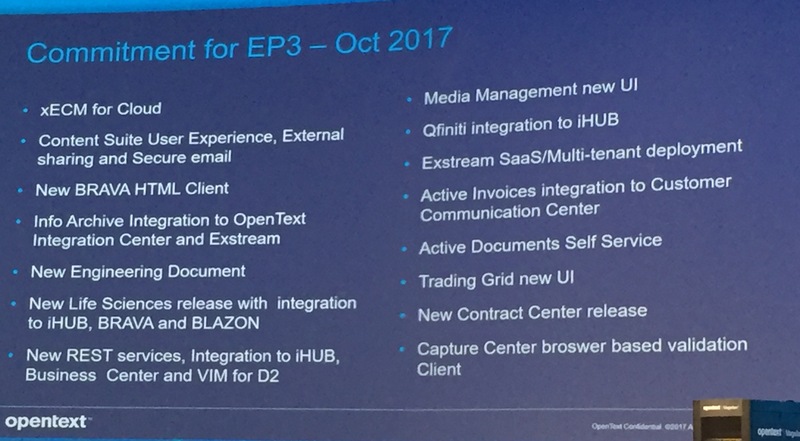 Majzoub finished with commitments for their next version — EP3 coming in October 2017 — covering enhancements across the full range of products, and the longer-term view of their roadmap of continuous innovation including their new hybrid platform, Project Banff. This new modern architecture will include a common RESTful services layer and an underlying integrated data model, and is already manifesting in AppWorks, People Center, Core, LEAP and Magellan. I’m assuming that some of their legacy products are not going to be migrated onto this new architecture. 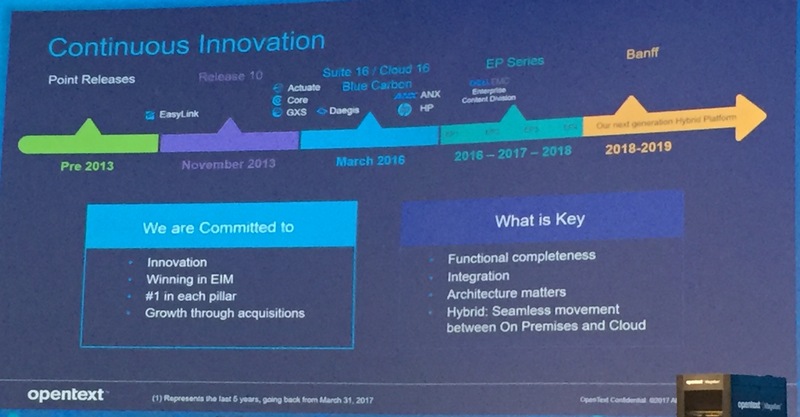 I also attended the Process Suite product roadmap session yesterday as well as a number of demos at the expo, but decided to wait until later today when I’ve seen some of the other BPM-related sessions to write something up. 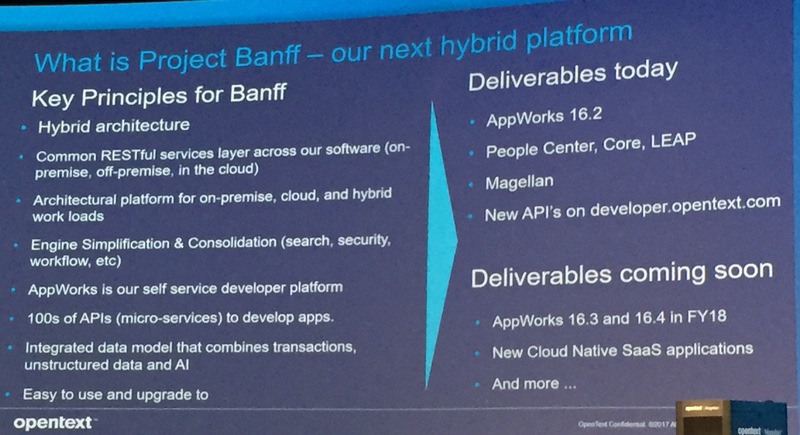 There are some interesting changes coming — such as Process Suite becoming part of the AppWorks low-code application development environment — and I’m still getting a handle on how the underlying Cordys DNA of the product is being assimilated. The last part of the keynote was a session on business creativity by Fredrik Härén — interesting! Independent analyst and systems architect specializing in business process management and Enterprise 2.0. Previously founded two successful product and service companies focusing on content management, BPM and e-commerce. Featured conference speaker on BPM and its impact on business, and writes the Column 2 blog on BPM and Enterprise 2.0. All posts are © Sandy Kemsley.